All the fuss about the Dota 2 tournament finally got my curiosity up, and I decided to reinstall it. Steam tells me I’ve played it for 45 hours, pretty much every one of which was full of confusion and dread. If you know TF2, you know it takes some time to learn to play the nine classes, and many players never bother with some of them. In Dota 2 and LoL there are over a hundred. They do break down into overall roles (pusher, support, jungler, assassin…), but their abilities vary and each has to be learned separately. Worse yet, you have to learn how to play against each one, and then you have to worry about which ones combine together well. Oh well, there’s only ten thousand possible combinations. No wonder there’s enough strategic depth to support professional competition. 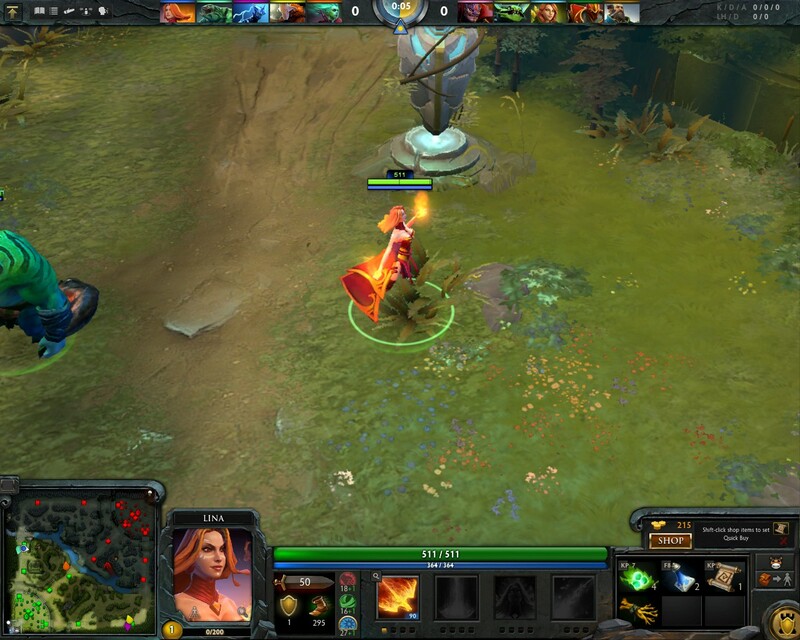 So anyway, I tried some Dota 2 and never felt like I was getting it. 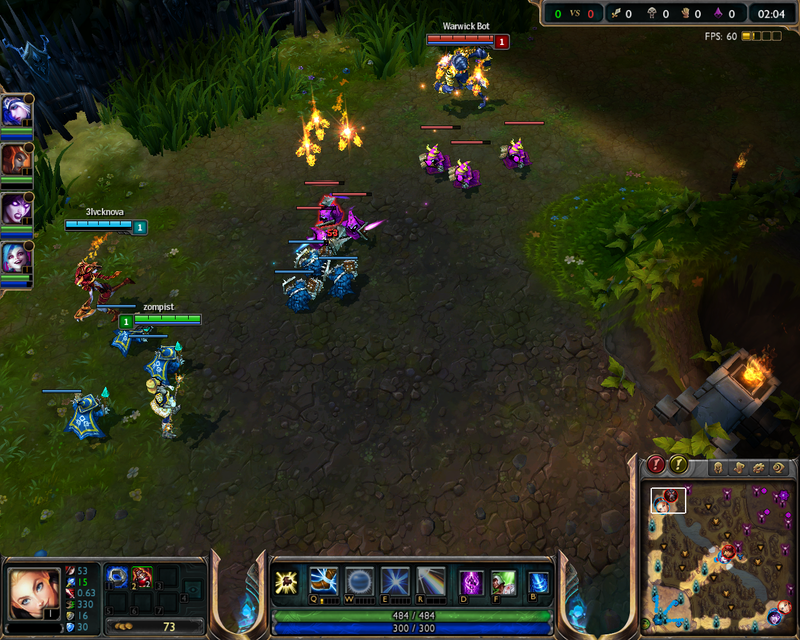 So I decided to try out League of Legends, not least because my friend Ash works for them. For what it’s worth, I think LoL is a little easier to pick up. You don’t have to worry about denies (killing your own creeps so the enemy can’t), or carriers. Plus it feels like you can use your spells a little more generously, which is more fun. But they’re really very similar games. The basics of the game are simple enough. Most of the fighting is done by hordes of NPC minions, who advance to the enemy, fight them, and destroy protective turrets. If you destroy the enemy’s farthest building, the Nexus, you win. You play a Champion, who can attack enemy minions and turrets and, more importantly, harass or kill enemy Champions. You pretty much have to put aside your FPS reflexes. You don’t just whale on minions– you only get gold and XP if you actually kill them (getting the “last hit”). In the early game you’re weak, and it’s best to wait till you can be sure of getting that hit. You use the XP to advance in level, and the gold to buy items to enhance your skills. You generally reserve your abilities (which have a cooldown and so must be doled out) for enemy Champions. It takes a delicate balance to wear them down without taking too much damage yourself. Most champions have an “ult”, a skill with high damage and long cooldown, which you want to save for a killing blow. If you want to try it, there’s some brief tutorials, and then you can try games against bots, at three difficulty levels. Just dive in; you’ll be matched with people of your level, so people rarely expect you to have skills you don’t know. In bot games, in fact, people tend to be pretty quiet. There’s no voice chat, which makes strategy a little harder but does avoid toxicity. I’ve only played two games against humans, because then you need more skills– e.g. recognizing when enemies are missing, ‘cos then they’re probably hiding and waiting to gank you. I won one and lost one. The login server is down right now, or I’d be playing rather than blogging. You can play any champion in Dota 2, but In Lol you must use a small set of free ones, or unlock them with in-game experience or actual cash dollars. This sounds restrictive but is probably a better introduction, since it focuses your attention on learning a few champs at a time. So, is it fun? So far, yes. I’m intimidated by the learning curve, but the matchmaking system means that (unlike, say, my other fave team game, Gotham City Impostors), you won’t get into a noobs-vs-gurus rout. Like any team game, it’s most fun when you play with friends, so bring a few along.